OSRAM Opto Semiconductors has released their first OLED Lighting product, called the ORBEOS. It has a round surface (88mm diameter), is only 2.1mm thick and weights 24g. The efficiency is 25lm/W. The panels are actually available now via OSRAM's site. The temperature is warm white color (2,800K, CRI up to 80) like an incandescent lamp. 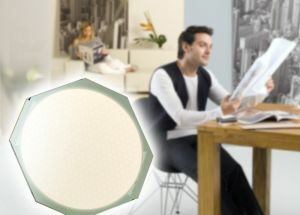 The panel can be switched on and off without delay, and is continuously dimmable. It emits no UV or infrared radiation, and does not contain mercury. Its brightness level is usually 1,000cd/m² with power input of less than a watt. In ideal operating conditions it has a lifespan of around 5,000 hours. ORBEOS is available with a frosted glass surface. 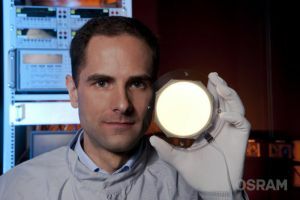 OSRAM say that the rapid-advance of their OLED Lighting program is due in some part to the OPAL project (Organic Phosphorescent Lamps for Applications in the Lighting Market) which probably suggests that they are using Phosphorescent materials. It's interesting to comprare the ORBEUS to Philips' Lumiblade panels. Philips offers many sizes, while OSRAM chose to offer just one. The OSRAM however seems to be more efficient (25lm/W. Philips say that their panels are between 10 to 20lm/W). The OSRAM costs about 240Euroes, while the Philips 'tall-dot" which is a bit smaller (70mm) costs over 300Euroes.